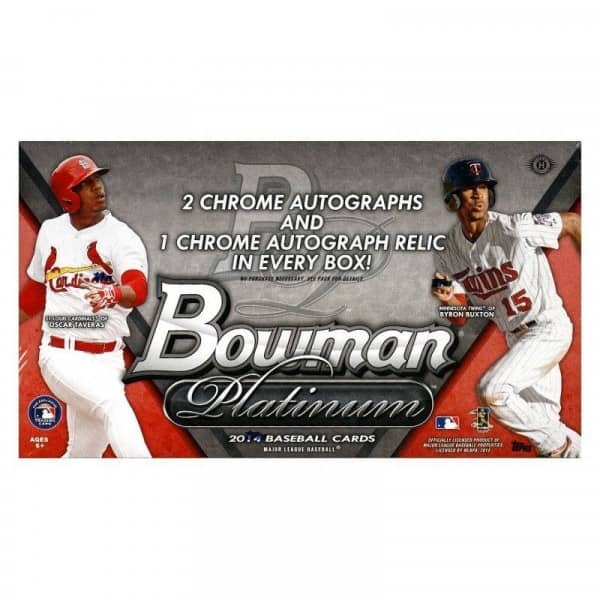 Factory Sealed 2014 Bowman Platinum Baseball Hobby Box mit 20 Packs Per Box a 5 Cards Per Pack. 2 Prospect Refractor Autgoramme und 1 Refractor Relic Autogramm per Box !!! Produktinformationen "2014 Bowman Platinum Baseball Hobby Box MLB"
Factory Sealed 2014 Bowman Platinum Baseball Hobby Box mit 20 Packs Per Box a 5 Cards Per Pack. 2 Prospect Refractor Autgoramme und 1 Refractor Relic Autogramm per Box !!! - Green Refractor #'d to 399. - Blue Refractor #'d to 199. - Red Refractor #'d to 25. - 5-Tool Die-Cut featuring the best 5-Tool players in the game. - Die-Cut Relics. #'d to 50. - Die-Cut Autographs. #'d to 25. - Die-Cut #'d to 25. - The top veterans and rookies of MLB on rainbow foil board. - Orange Refractor #'d to 10. Hobby Only. NEW! Weiterführende Links zu "2014 Bowman Platinum Baseball Hobby Box MLB"
Fanbewertungen für "2014 Bowman Platinum Baseball Hobby Box MLB"